Kaizen Master is specialized in just really essential function then the price could be low for customers to introduce very easily by yearly subscription. 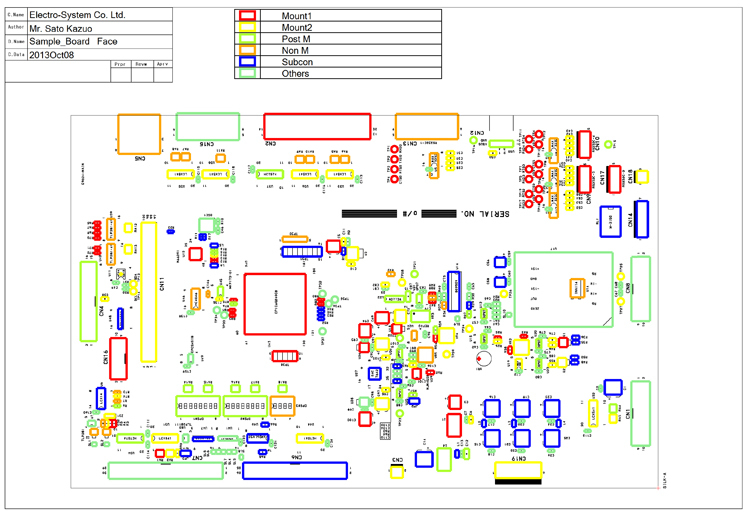 Kaizen Master is equipped basic function essential for PCB mounting arrangement while inexpensive. Kaizen Master is really practical application tool for daily work. Searching component name, reference or mounting position of component mutually. Kaizen Master requires only easily available data for its all function to operate without imposing any labor on the client or board designer. Component data - Kaizen Master can deal with any format. 1. Create component's frames on desired position of board picture displayed. 2. Acquire the coordinate data of each reference with the function of "Create coordinate data". 3. Register the created component's frames to the library then such frames are registerd with corresponded component names. 4. Such coordinate data and component frames' data (library) which have been created or registered can be available for next time and later. If use of the tool acquires special knowledge, training or assigning the predecessor, we cannot declare such tool is practical. 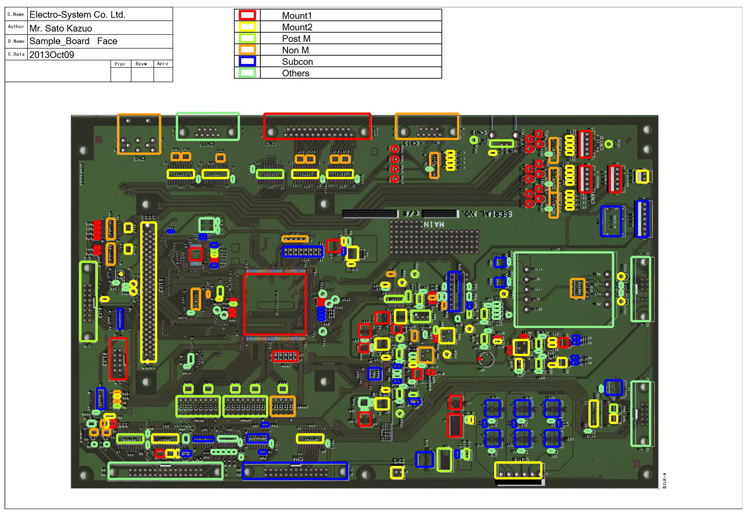 Kaizen Master has been developed to focus on capable to be handled with only basic knowledge about PCB mounting. Also equipped various supporting function for improving work efficiency with excellent usability. It is important for customers to acquire prompt support because Kaizen Master is a practical tool for daily work. Electro-System Co., Ltd., the developer promises to handle customers' inquiry by email immediately. 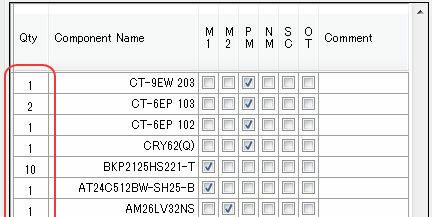 Besides, it is further easy to register component list or coordinate data edited according to Kaizen Master's form. 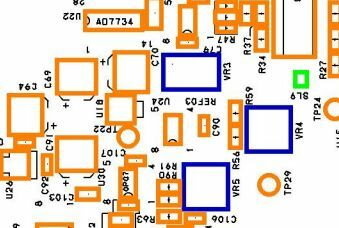 Create component outline displayed in the mount drawing or work drawing of post-mounting by silkscreen data automatically. It achieves to reduce a lot of working time comparing with manual setting. Available to switch a background of mount drawing according to the board property or worker's choice. Available to set mounting category while switching between each component name and each reference. (Display component name and its number of mounting in the mode of each component name and display reference names and its number of mounting in the mode of each reference. Available to display comment or warning in the mount drawing or PC display. Such statement for worker deducts simple mistake and improves quality. Available to display No.1 pin mark or polarity mark in the mount drawing or PC display. Available to set collectively No.1 pin mark or polarity mark to all same name components. Equipped with other various useful function and device. Switching a display between view and hide for each work category. Scaling up & down the view of board drawing by scroll button. Moving the position of board drawing view by mouse operation. 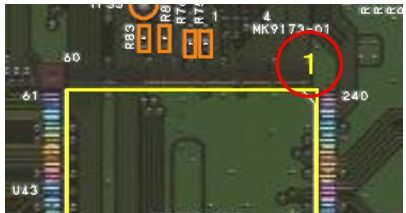 Displaying general board drawing useful for the time to enlarge board drawing view. Displaying face side or back side useful at searching a mount position of component. Correcting gap of imported board picture. Correcting direction of board picture. Adjusting color, width and paintout of component outline. Copyright © 2012-2015 ELECTRO-SYSTEM CO., LTD. All Rights Reserved.